HONOLULU – The Hawaii Department of Transportation (HDOT) advises Oahu motorists that the eastbound H-1 Freeway will be closed between the Campbell Industrial Park/Barbers Point Harbor offramp (Exit 1A) and the Wakea Street onramp on Sunday night, Dec. 17, 2017 through Thursday morning, Dec. 21, 2017 from 9 p.m. to 4:30 a.m., nightly, and Thursday night, Dec. 21, 2017 from 9 p.m. to 11:59 p.m.
A full closure of the H-1 Freeway is necessary for crews to work on the Farrington Highway overpass as part of the Kapolei Interchange Complex, Phase 2 project. Electronic message boards will be posted to warn motorists of the full closure. Special Duty Police Officers will be on-site to assist with traffic control. Emergency vehicles, first responders, and TheBus have been notified of the roadwork and will not be allowed through the work zone. In addition to the full closure, other lane closures associated with this project are listed below. 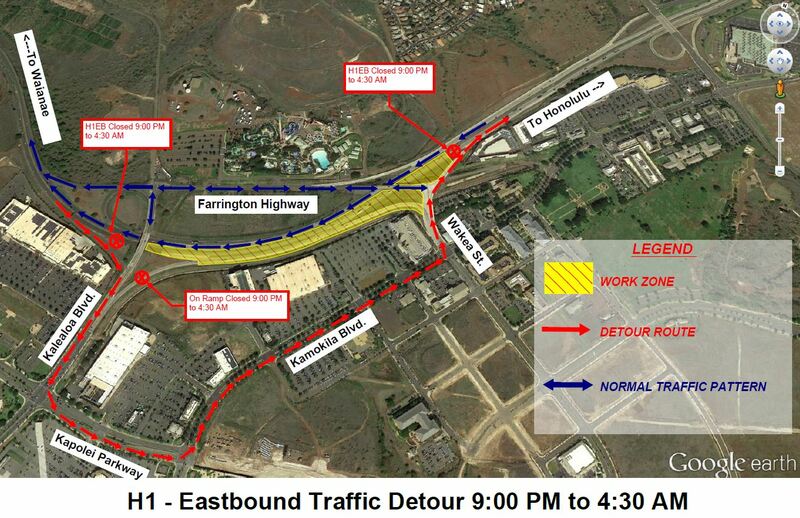 • Right turning lane closure on the Makakilo/Kapolei/Kalaeloa offramp (Exit 2) from the H-1 Freeway in the westbound direction on Monday, Dec. 18, 2017 through Thursday, Dec. 21, 2017 from 8:30 a.m. to 3 p.m.
• Right lane closure on the H-1 Freeway in the westbound direction between the Makakilo Drive overpass and the Farrington Highway overpass on Monday, Dec. 18, 2017 through Thursday, Dec. 21, 2017 from 8:30 a.m. to 3 p.m.